Environmental Site Assessment (ESA) / Due Diligence projects require timely, accurate, and reliable reports. For clients involved in an acquisition, sale, lease, merger, etc., EGS can provide a comprehensive assessment in accordance with standards set forth by ASTM, financial institutions, or by state regulations. Our assessment provides valuable assistance to our clients in their decision-making. A typical Phase-I ESA provides property owners, prospective buyers, or lending institutions with a detailed historical review of the target property outlining potential areas of environmental concern based on site reconnaissance, historical records review, and surrounding property use. Site assessment under regulatory oversight is performed in compliance with the Preliminary Assessment requirements such as those outlined in New Jersey's Technical Requirements for Site Remediation. Underground Storage Tank (UST) Services includes the many phases of UST management: registration, upgrade, testing, removal, abandonment, closure, investigation, and remediation. EGS's certified personnel have extensive experience in UST closures, site assessment, soil/groundwater remediation, and reporting in compliance with NJDEP's Technical Requirements for Site Remediation. 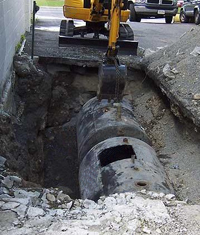 Typical closure/cleanup activities include obtaining permits, removal or abandonment of USTs, subsurface evaluation, oversight of excavation, sampling, and backfill, as well as coordination of soil disposal. As with all of our services, our goal is to provide our clients with quality project management, quality reports, and expedited case closure. It should be noted that recent regulations in NJ require the closure of non-regulated tanks (such as residential fuel oil tanks) to be performed by UST certified firms. Site / Remedial Investigations involve the active sampling of media (e.g., soil, groundwater, air, sediment, surface water) to determine the presence or extent of contamination. 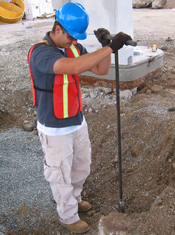 Our technical personnel are experienced in performing cost-effective sampling methods, including the use of soil boring equipment to determine or delineate soil contamination. EGS's personnel have extensive experience in site investigations related to the New Jersey Industrial Site Recovery Act (ISRA), USTs, and many other types of spill investigations. Additionally, EGS provides asbestos/lead assessments associated with building materials. Soil / Groundwater Remediation is designed and implemented based on the most cost-effective solutions, and in compliance with state or federal requirements. EGS always provides clients with alternative options for soil and groundwater cleanup. EGS's engineers and geologists work jointly to determine the most cost-effective remedial systems based on site specific conditions and client budget. Our specialty is remedial system design that may include pump-and-treat systems, air sparging systems, chemical oxidation techniques, bioremediation, and natural attenuation proposals. Waste Management Services are provided by EGS using cost-effective strategies. Most of our cases involve the disposal of contaminated soil, waste petroleum products, and spent absorbent materials. EGS will also arrange for disposal of non-petroleum waste. EGS will find the appropriate disposal facility for the waste, perform the necessary sampling requirements, and prepare the necessary documentation before and after disposal. Indoor Air Quality Assessments are performed by EGS staff to evaluate the potential presence of a wide range of harmful airborne contaminants associated with site operations, onsite spills, offsite sources, or vapor intrusion from contaminated soil and groundwater. Air quality assessment projects typically include office and commercial buildings, warehouses, processing plants, and day care centers. Some common indoor contaminants include volatile organics, mold, and dust. Project Management / Regulatory Compliance involves the review and evaluation of current problems or issues, determination of cost-effective alternatives, and good communication between the client and our project managers. EGS maintains a close relationship with our clients and subcontractors which eliminates unnecessary delays and minimizes expenses. Our knowledgeable professionals will secure the necessary permits and communicate with regulatory agencies to obtain compliance for our clients. Our work is performed with adherence to safety protocols which ensures the completion of projects with little or no deviations from the original design.